13240 Neighborhood Rd Von Ormy, Texas is conveniently located with easy access to major highways including IH 35, Loop 1604 & 410. This home sits just outside the city of San Antonio and offers the appeal of quiet country living, yet is just minutes away from everything the beautiful & vibrant city San Antonio has to offer. It’s rare to find a vintage home that has been expertly renovated in a small secluded community. This home is so spacious with an oversized living area, huge separate dinning area, 4 bedrooms 2 baths and over 2500 square feet, it provides so many options to the new owner. The kitchen has been updated with fresh paint & tile work & has its own entrance leading to one of the many outdoor deck spaces to enjoy. The master retreat is lovely & boasts a private entrance & deck. The additional bedrooms are spacious & full of natural light. If you’re looking for an affordable home that offers a large amount of space, almost an acre of land, move in ready & NOT located in a crowded subdivision this one is a “Must see”!!!! This home is offered exclusively by Becker Properties, LLC. Call one of our REALTORS today to set up your private showing! Von Ormy, Texas is conveniently located with easy access to major highways including IH 35, Loop 1604 & 410. 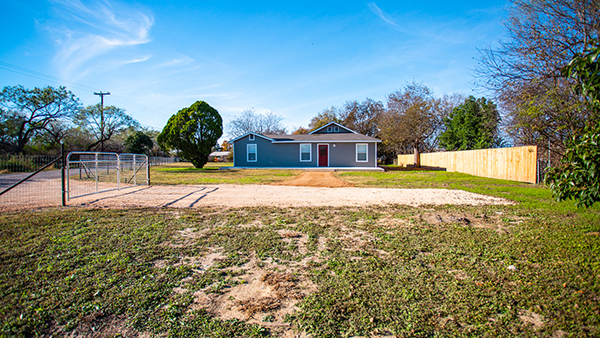 This home is just minutes from downtown San Antonio and offers the appeal of quite country living yet is just minutes away from everything the vibrant city San Antonio has to offer. It's rare to find a vintage home that is exquisitely renovated in a small secluded community. This home is so spacious, over-sized living area, huge separate dinning area, updated Kitchen. Fresh paint and flooring.